The Perazzi HPX shotguns brand includes the RS1, RSR and the DSR shotguns and through them John Jeffries has helped to revolutionise high bird shooting. John Jeffries puts a lot of road miles and effort into ensuring that his customers’ guns are an absolutely perfect fit. What’s the most radical change you’ve ever had made to your shotgun? There are lots of alterations a gunsmith can make to give us a better picture of our target, but how about gluing on a reversed rib? That might sound a little fantastic, but it’s exactly the kind of thing John Jeffries has been doing for years, sometimes to great applause, sometimes to an awkward murmur. Readers of a certain age might recall Faster, a song on the Manic Street Preachers’ album The Holy Bible, which opens with the lyrics “I am an architect, they call me a butcher/ I am a pioneer, they call me primitive”. Despite learning of his deep love of music during our interview, I shied away from asking John if he was aware of the song, but still wondered if he could relate to the accusations if prompted. Knowing what I did about the nature of his work in the field of shotgun modification – most notably with Perazzi through the Perazzi HPX brand – and his own public admission that this work is “controversial”, I also wondered if he felt he still had to convince anyone in the gun trade that his modifications were absolutely necessary. To get the full story I would have to go back to the beginning. The affable 71-year-old from Eastbourne’s took up shooting whilst an undergraduate at Plumpton College and didn’t buy his first shotgun, a BSA snipe single barrel, until after he got married in 1964. He learned to shoot by relying on the written words of Percy Stanbury and G.L. Carlisle rather than the advice of an instructor, and it was an interest in mechanics and welding that got him on to repairing and modifying shotguns, as well as selling them. His move from layman to gun trade member was fairly rapid – John established a number of clay pigeon shooting clubs in the 1970s and opened Diamond Guns in Heathfield, East Sussex, in 1978 – and the changing nature of clay shooting at the time also gave him the confidence to take his modified shotguns further than his own cabinet. “I was always dissatisfied with the performance of most shotguns which were commercially available at that time,” he explained. “For example, 26” – 28” barrelled guns were common back in those days, so if you’d taken a 30” barrelled shotgun to a clay ground they would have laughed at you. Now 30” barrels are the shortest that almost anybody uses. I immediately realised that a long barrelled gun was even better than a 30” barrelled gun so I started my customisation when most were still using the shorter barrels. John also started modifying shotguns at Diamond Guns almost from the first week’s trading, the first being a Beretta 686 DTL. John has referred to his work as “radical and controversial” and his next modification caused quite a stir amongst his friends and colleagues – whatever they thought, it was certainly an example of a growing conviction in his ideas. The episode marked the beginning of a range of ‘DG2’ shotguns, all sold under the Diamond Guns banner and all from Perazzi, a company John didn’t actively engage with at first until he began visiting the factory to have its own MX8 built to his specifications. “On the first unit all they did was chamfer the back of the step of the rib, eventually making me a very nice slope which was about 2cm long that gave a better target vision without attracting the eye too much, and that was the main modification,” he explained. John went on to develop several shotguns for clay and game shots exclusively with the Italian firm under the DG and later Perazzi HPX range – the first shotgun for game shots was the DG1, a rib-less 7½lb side-by-side – until earlier this year when his latest addition, The Elite, was developed in partnership with its compatriots Perugini & Visini. So what was it about Perazzi that drew him towards the firm? Feel is something that’s important to John. 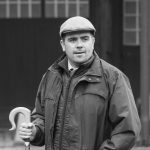 We covered subjects like shootability during our discussion – the difference between how a shotgun feels in hand in the shop and how it feels when you’ve put a few cartridges through it – and even the merits of practising your gun mount with both eyes closed because of what it can do for muscle memory. He is also “fanatical” about triggers. 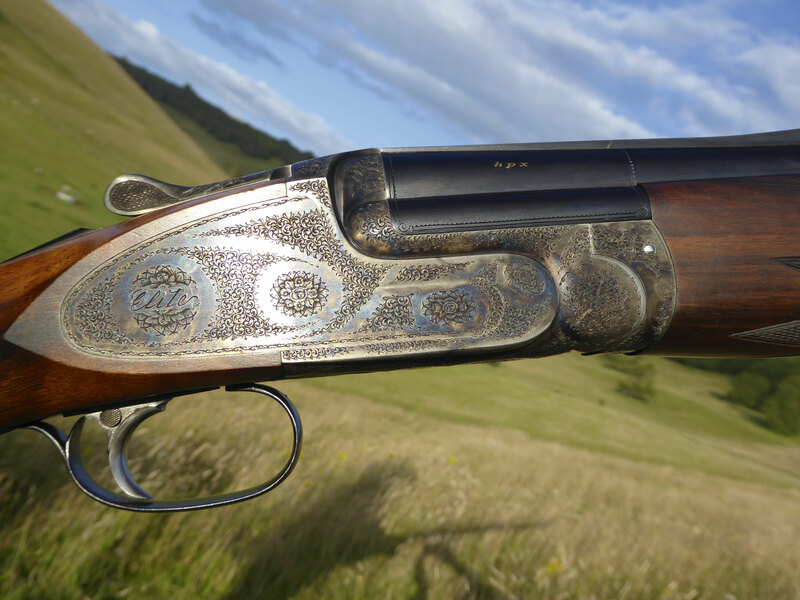 After a brief hiatus from gunmaking in the mid 1990s John returned to the gun trade in 2003 with the first shotgun in the Perazzi HPX range, the SR1, which is an updated version of the DG range. Its design was based on the DG2 design in that it has a similar short ramp but was also seriously biased towards game shooting to meet the growing demand for a shotgun that could hit high birds. Taking shotgun design even further, John ventured into the unknown by trying an idea he had from the earlier years – a reverse slope to the top rib. The RSR was born. John admits to being nervous about its performance and enlisted the help of Frank Hascamp, a noted Belgian shot, to put it through its paces. One can only guess as to how far into Frank’s score of 39×40 that John knew he had backed a winner. The first RSR was intended to be an all round shotgun and was followed by the DSR, which is more biased to the clay shooter, being slightly heavier and with a more concentrated view to the target. The Game Fair at Harewood House this year marked the launch of The Elite, the culmination of John’s wish to take a shotgun “to the top of his designing power” and “produce something that’s a little more controversial still” with a new rib design that dips away from the sight picture allowing both a conventional and radical target view. Each of the HPX shotguns has taken a year to go from the drawing board to the shop floor, and it was interesting to learn John didn’t take any grand designs along with him to Perazzi for the first meeting with his new collaborators. He has modified in all cases what are well known and highly respected designs from gunmakers who have both been willing to co-operate and are thrilled with the results. The Elite is the result of John’s collaboration with Italian firm Perugini & Visini. Now you might be thinking why not just buy a Perazzi and have a gunfitting session? With links to shooting grounds all over the country, the customer gets more than sales patter when it comes to ordering a gun from John. He prefers to meet his customers face to face – though once fitted for a customer from Australia via Skype – with all of the necessaries about their shooting, measurements etc., much like you would do when visiting a tailor for a suit, but with a try gun rather than a box of pins. The shotgun is handed over to the customer only after return visits to the shooting ground for the second or third fit. Spend even a short time with John Jeffries and you’ll realise how much he loves talking to people who share his passion for shooting0. There wasn’t an ounce of arrogance in his voice as he cited the RSR and the DSR as the shotguns he’s most proud of, mainly because of the way they’ve challenged people’s perceptions about what they see when they’re shooting. He doesn’t apologise for his controversial designs and he doesn’t want recognition. What he does want, and is most sincere about, is that his shotguns fit his customers. For more information about The Elite and the other shotguns in the Perazzi HPX range from John Jeffries, visit perazzihpxshotguns.com.